After people ask us how we’re sleeping and if our little baby is healthy after her NICU fiasco, the next questions are usually about our toddler and how she’s doing as a big sister. Is she jealous? Is she gentle? Does she like the new baby? Now before I brag shamelessly about my oldest child, let me start with a disclaimer. Most of the time, the tot does her own thing and is indifferent to the baby. During Z’s first 48 hours at home, the phrase we heard most from Big Sister was, “Baby Sister, Watch this! Watch me!” However, Big Sister quickly learned that Little Sister wasn’t doing much watching. She was mostly sleeping. And eating. And pooping. (Sometimes all three at the same time.) So Big Sister started to pay less and less attention to her sister. With that said, let’s get back to the bragging! Toddlers are supposed to be selfish and self-centered. They’re supposed to be jealous of the new sibling (aka the competition). They’re supposed to be feisty and mean, because they suddenly have to share mom and dad with a new, demanding little one. It started in the hospital. 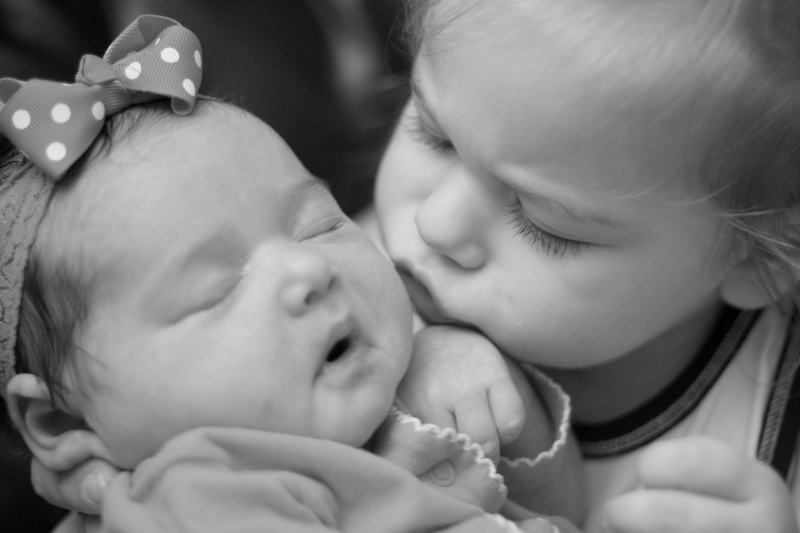 Big Sister cried when she couldn’t visit her baby sister in the NICU. And not a whiny, pouty cry. She was sad. Before her nap today (which the toddler now tries to avoid by using the very rational argument “My awake now. My happy!”), we were sitting on the couch reading books. Big Sister asked to help hold the baby and then she made a point to show Z all the pictures. That’s right! Pass on your love of books and reading! So while I know that two sisters so close in age will inevitably fluctuate between best friends and frenemies, I’d say their relationship is off to a good start. And A has shown me some of the better parts of human nature–selflessness, purity, compassion. I could learn a lot from my little big girl! A has two wonderful examples to learn how to love selflessly and how to care for one another. You and Nate are wonderful parents and those two little girls are very lucky. You’re always so encouraging, Melissa. But we can’t take the credit. The example the girls see in us is (unfortunately) plenty flawed and selfish!